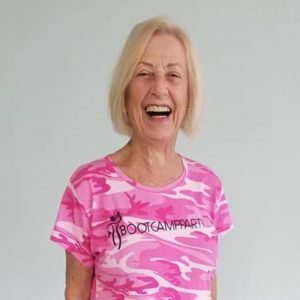 Introducing Boot Camp Party Member of the Month of October: Ms. Arlette Brown! Despite being the oldest person who’s ever signed up for my class (she’s 81), she inspires me everyday she’s there. She may not be able to get everything correct on the first try, second try, or even the third try, but she shows up and shows out! And to me, that means the world! Love love love her spirit, love her energy, love her! I think I’ve been in your class for three months. I absolutely love the workouts which for the most part I can follow. I love your choice of music which makes the workouts so much fun. I came after Jacqueline Jaffe kept “bugging” me to join. I truly believed it would be too hard for me, in view of my age. I suffer from arthritis and working out has helped. I generally feel better and more agile. I’m the type of person who over the years joined multiple gyms . I’d buy a 1 or 2 year subscription , go for 2or 3 months and then give up. I never felt motivated and would get bored with the whole process. My only regret is that I didn’t join your Bootcamp much earlier . Okay boot camp peeps, show our girl some love!